We have probably never wondered how mason jars can do wonders when turned into candles. Here you will enjoy a variety of 10 DIY Mason Jar Candles You Must See for making candles out of mason jars. Learn the procedures of these projects and try them out soon this season. The first one that we have here is a peppermint candle which is so cool and impressive. Try this out this Christmas and enjoy decorating it at the favorite spot of your house. The next project that we have here is of the colored candles inside the DIY Mason jar which looks super romantic and is a perfect piece for your bedroom. Have a look at this Mason jar lantern which is completely urban contemporary and is so classy for house decoration purpose. You can also make some for the occasions such as 4th of July in the colors according to the theme. Next are some spray painted mason jars for holding candles. Tutorials are so also available for these projects so that you can make these easily. Have a look at this unique and one of a kind music sheet mason jars with jute string knot at the top of the jar. 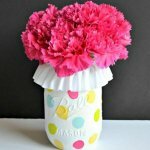 Next we share with you this simple yet beautiful soy wax Mason jar project. Have a look at this chic Mason jar lightning idea made out of Mason jar. Try these different ideas for making candles out of mason jars for your house decoration this season and amaze your friends and family with your creative skills. Watch the details and tutorials by clicking on the links given below the pictures.